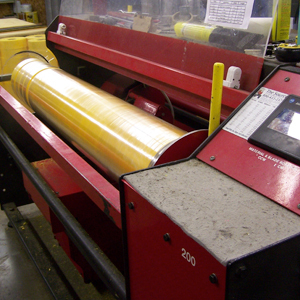 Custom Material Slitting for rolls up to 63 inches wide and 23 inch diameter. 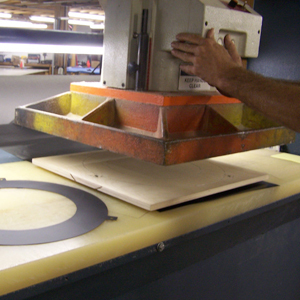 Your material will be carefully cut to your specifications and promptly returned for your use. 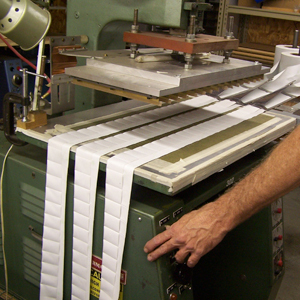 In addition to custom slitting, rewind conversion is offered to create specialized roll sizes. We have slit full size rolls of everything from 40 oz heavy duty vinyl to bulk roll soft suede materials. 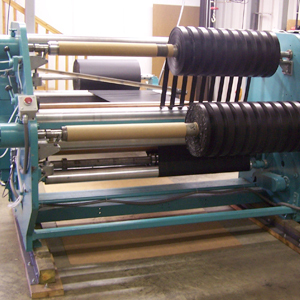 This rewind slitter has the capability to slit a master roll that is 63” wd. x 23” dia. into rolls as narrow as 1.5”. It can slit master rolls that are not evenly wound and do not have consistent thicknesses across the width of the material. This is a CNC roll slitter. It can be programmed to slit material that is 63” wd. x 12” dia. into rolls as narrow as 1/2”. At Foremost Flexible we can provide a wide range of services including slitting, assembly, and cutting for your industrial contract needs. For long and short runs from simple to complex, let us know and we can help you. In an effort to better serve our customers, Foremost has expanded to offer CNC computerized cutting of individual parts. The traveling head press can cut multiple layers of material using a die which produces uniform parts. This press can accept material that is 62”wd. This hot air/wedge welder can be used as a hot air welder for light weight fabric welding applications. The hot air welding is used in the welding of multiple panels to make products such as ventilation tubes, light weight curtains and light weight tarps. When used as a wedge welder, heavier weight materials can be welded together to make large weather resistant products and structures. 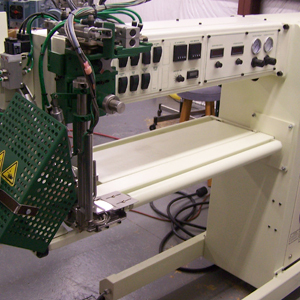 This dielectric welder is used to weld/seal vinyl and urethane material. It is used in the manufacturing of products that require uniformity and water/air tight welds.